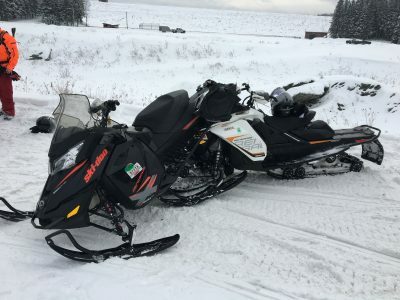 PITTSBURG, NH – Two men were lucky to escape injuries after their snowmobiles collided on Trail 20 in the area of Murphy Dam in Pittsburg on Sunday morning. Just after 10 AM, Conservation Officer Chris Egan came upon the collision while patrolling trails on his snowmobile. “The crash had occurred just seconds prior to my arrival on the scene”, Egan stated. “I came through the Murphy Dam junction and observed two stationary sleds connected together and a man lying in the trail”. After radioing for emergency personnel to respond, Egan identified the operators, neither of which appeared to be suffering from serious injuries. Personnel from Pittsburg Fire Department, Pittsburg Police Department and 45th Parallel EMS responded to the scene. 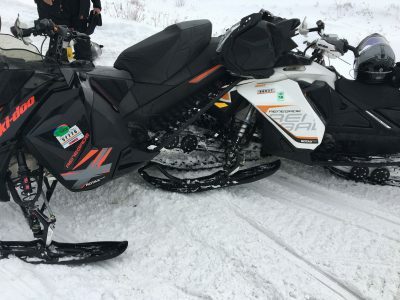 An Investigation determined that a snowmobile operated by 52-year-old David Lawton, of West Stewartstown, had rear-ended a snowmobile operated by 53-year-old Patrick Bennett, of North Stratford. The impact ejected Bennett from his machine. The two men had been riding in the same group, along with several other local friends at the time of the crash, and both refused medical treatment. Both of the involved snowmobiles sustained moderate damage. Lawton was cited for operating at a speed greater than reasonable and prudent for the existing conditions, with a collision resulting. Alcohol impairment was not a factor in the crash.